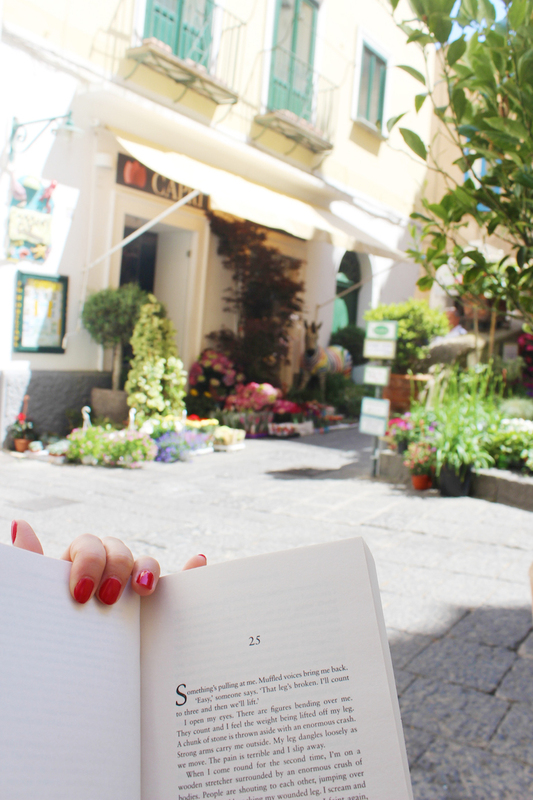 On day two of our Italian adventure, we went to Capri. Some people love Capri. In fact, many of my friends who have visited the Amalfi Coast recommended that we make the island of Capri our basecamp for the trip. While I found Capri incredibly beautiful, I also found it slightly more stressful than Positano, as the island was swarming with tourists. Massive cruise ships sailed in and out of the port, docking so thousands of visitors could climb ashore. To be fair, we were also four of the thousands :) but as Capri was an island, it felt slightly more cramped than in Positano, without a lot of free space to escape the rush. In Positano, our little square was quiet, but in Capri, it was hard to take a photo without hundreds of other people walking through the backdrop. That said, Capri had an extra dose of harbor-side magic that we did not find in Positano. While Positano is flanked by tall cliffs and colorful houses, Capri is more flat, even boasting of a small sand beach at the waterfront. The colors of Capri match that of Positano, with pasted rainbow houses and boats lining the shorefront and climbing up the hills. To get to Capri, we took the ferry from the harbor in Positano. There are many different ferry and tour options, and all run pretty regularly. If you know in advance that you would like to travel by boat to Capri or Amalfi, book your ticket ahead so you are sure to get a spot. For our day trips to Capri and Amalfi, we booked our tickets the night before, so securing a seat on the boat was not a problem. However, a lot of the smaller luxury boats and sails were already booked up, so if you’re looking for something a bit more intimate, I’d suggest reserving a few days in advance. My favorite part of our day adventures was setting off from Positano. I think Positano is just the prettiest village along the Amalfi Coast, and getting to see it as we pulled away from the shore in all its rainbow glory was a treat. The picture above is my favorite landscape photo from the trip! 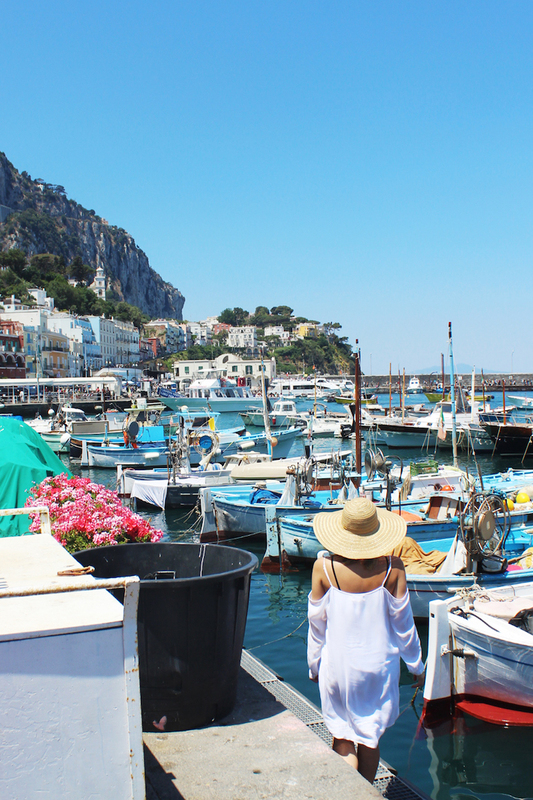 It took our boat about 40 minutes to get to Capri, but there are slower, less expensive options that can take up to 80 minutes. As we pulled into the harbor, Capri seemed to smile. Boats in the harbor bobbed ‘hello’ and the sun twinkled over the island. 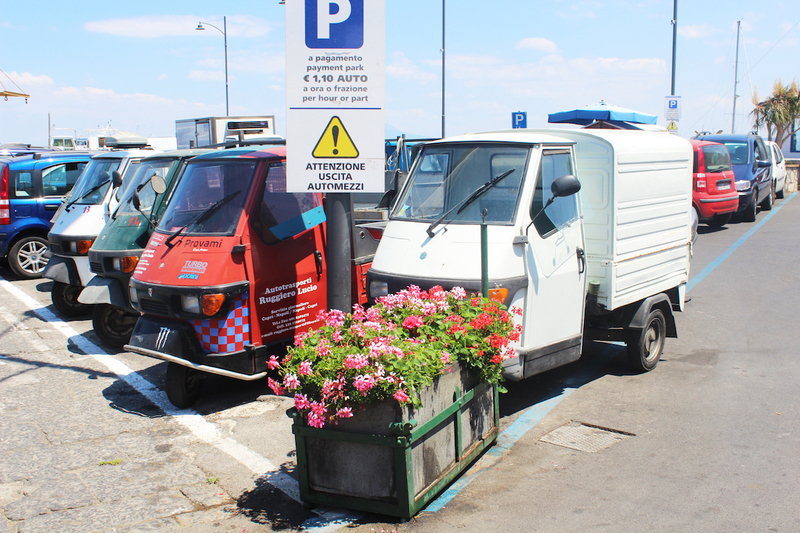 We pulled up to the docks and disembarked, and were immediately swept into throngs of tourists strolling along the waterfront, taking in the sights and popping in and out of shops and restaurants. Capri has twelve churches, seven museums and numerous monuments. The Blue Grotto (a cave) is one of the most popular attractions on the island, but it was slightly too windy to visit on our day in Capri. We walked to the end of the strip which was much quieter, and way more to my liking :) We were all getting hungry at this point, so we stopped at Lo Zodiaco for a drink in the sun and some lunch. This seaside spot was dreamy, under a canopy of cream canvas umbrellas. 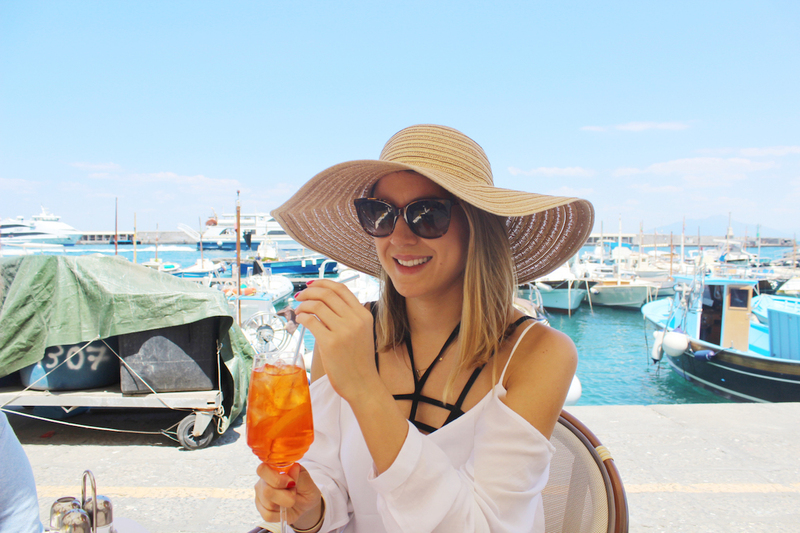 v v The fab fam :) Whenever I’m on holiday in Europe, my go-to drink is an Aperol Spritz. It’s basically three parts prosecco, two parts Aperol (an Italian apéritif that tastes like bitter orange and rhubarb), and a splash of soda water. It’s typically garnished with an orange slice and served on ice, and it’s delish! It’s also incredibly potent, especially if you’ve been galavanting about int the sun all day. v v Auntie Sandra looking fly in my hat! ;) Luckily, I wasn’t the only one indulging in a mid-afternoon drink, and even convinced my mom to get a spritz :) My cousin and aunt on the other hand had beers . . . . . . that wee triple the size you typically get in Amsterdam! I ordered a light lunch, since the day before I’d had pizza, and the day before that, I’d had . . . drum roll . . . pizza! (not to mention all the spritz’s and wine!) but even a light lunch in Italy looks like this: (aka to die for!!!) Note to self: when you order an arugula and tomato salad with prosciutto and parmesan in Italy, expect a heaping pile of the latter two. . . and maybe a few veggies hidden underneath! After our delicious lunch in the shade, we wandered uphill to check out the view and pop into a few shops. 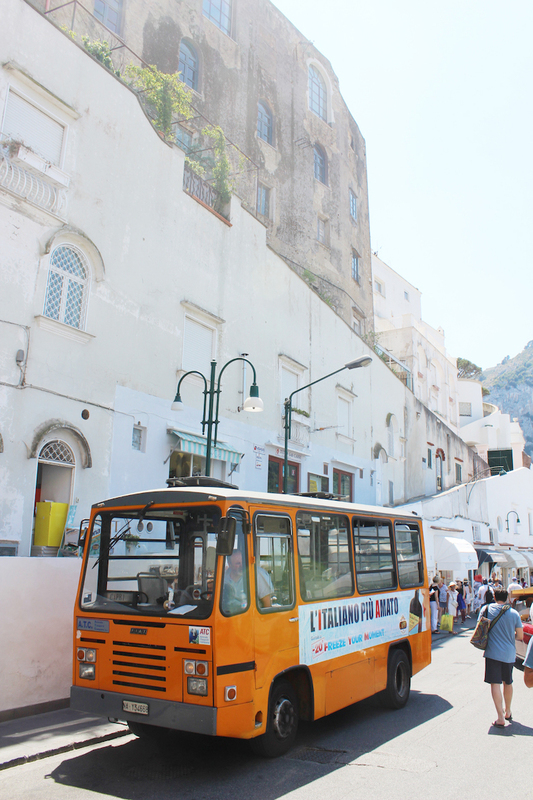 While we initially thought we could walk our way up through the winding roads of Capri, we ended up back down by the waterfront in line for the funicular with all of the other tourists. If I had spent more time researching Capri, I think we would have discovered pathways to the more residential neighborhoods. However, having arrived on the island without doing a lot of homework, we wound up playing it by ear and followed the hoards of tourists into the long line for the funicular to ride up the mountain. That said, it was a STEEP ways up, so I don’t think any of us minded piling into the small carts and hitching a ride up the hill ;) Julie and Sandra were in the compartment below us, making for an awesome (blury) photo opportunity. As we approached the top, it became clear there was a lot more vegetation in Capri than Positano – homes were sprawled out amongst vibrant greenery, with the turquoise sea drawing a stark contrast. When you’re on top of world, there’s only one thing to do. Get a slushie! While my mom, aunt, and cousin opted to take the Mount Solaro ski lift over to Anna Capri, I decided to find the less touristy side of Capri. I wandered down small paths and roads, in search of a bit of peace. 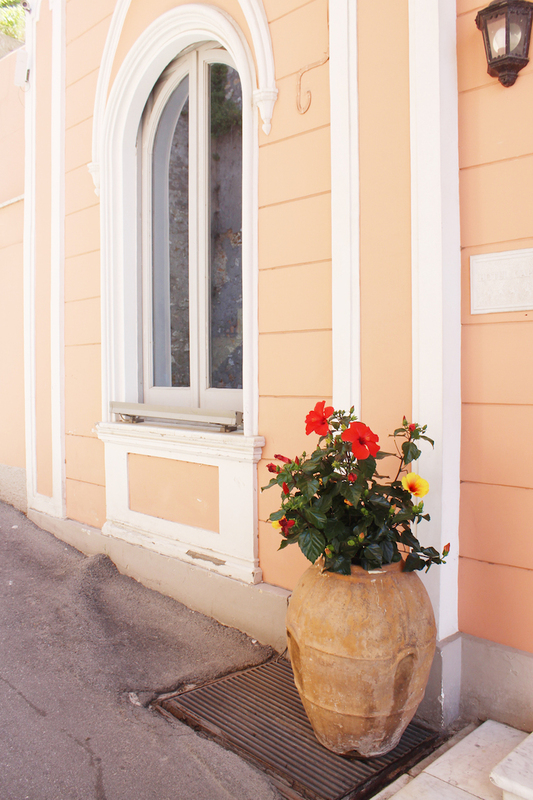 Eventually I found a small shady square, home to a colorful plant shop, a church, and barely any tourists. I settled down on the church stoop with my book, and had a quiet, peaceful reading session on the otherwise bustling island. one of the most beautiful destinations to visit, the weather, walking around the water, excellent food and music!! !